Begun in 2001, this was the first all-new Vermont & Adirondacks tour we designed since our original mountains tours were created in 1996. For years now, riders who’ve deeply enjoyed the twisty road riding, gourmet food, beautiful inns and spectacular scenery of our mountains tours (Best of the Mountains, Best of Vermont and Fall Foliage) have asked us to create another tour in the same region that covered new roads and new territory. After several years of research and refining details, we came up with the Northern Lakes Tour, a new adventure that lives up to the high standards set over the years by our mountains tours. Based in Montpelier, the state capitol of Vermont, this five night tour explores the lakes regions of the Green and Adirondack mountains. Much of the tour travels through state and national forest preserves. 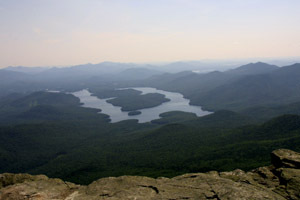 Mempramagog, Crystal, Willoughby, Parker, Sabin, Greenwood, Shadow, Salem, Derby, Eden, Champlain, Iroquois, Schroon, George, Brant, Friends, Long, Pleasant, Blue Mountain, Blue, Speculator, Cranberry...these are just some of the many lakes and ponds we’ll enjoy on the Northern Lakes tour. On the tour’s first day, we ride through Vermont’s most rural region, commonly known as the “Northeast Kingdom”. The kingdom is a rugged, unpopulated and beautiful jewel of New England. Howard Frank Mosher chose this as the setting for his novel "Where the Rivers Flow North" which critically acclaimed film maker Jay Craven later made famous with his 1994 film of the same name. Next we’ll make our way through the farms of northwestern Vermont and up into the Lake Champlain islands. 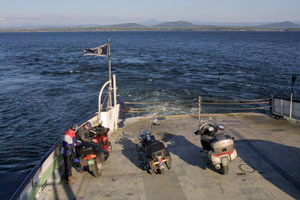 Crossing over the lake by ferry we’ll follow its western shore into the lower Adirondacks of New York state and over to a beautiful inn with a private beach and boats available for our enjoyment. A loop ride through the mountains and along the many small lakes of the southern Adirondacks will eventually return us to the same inn for yet another famous NMT gourmet dinner. Then on the last riding day of the tour, we’ll head into the high peaks of the northern Adirondacks and follow a private mountain road to a summit view that goes clear to Canada. Descending and recrossing the Champlain, this time by bridge, we’ll cross over Vermont’s best mountain gap road and return to our elegant tour base in Montpelier for the last night of the tour. This new five-night tour is fast becoming an NMT classic. 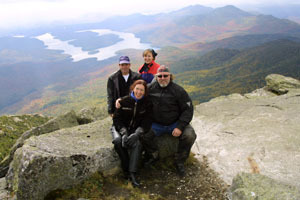 The Lakes Foliage tour can be combined with the Mountains Fall Foliage tour 1 for a two week tour of unforgettable riding amidst the autumn colors of New England. * Note: Loop rides begin and end at the same hotel, allowing you decide how far and how long you want to ride that day. See our schedule page for dates and pricing. Read comments from the press and other riders about touring with NMT. Take a look at a gallery of pictures made during our mountains tours (Best of Vermont, Best of the Mountains, Fall Foliage). 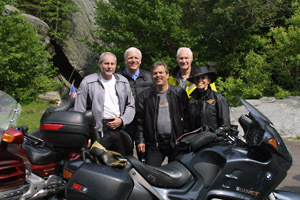 Other Options: The "Best of Vermont" tours explore the Green Mountains of Vermont and the Adirondack Mountains of New York during late May/early June. The "New England Foliage" tours explore the same region during late September and early October.